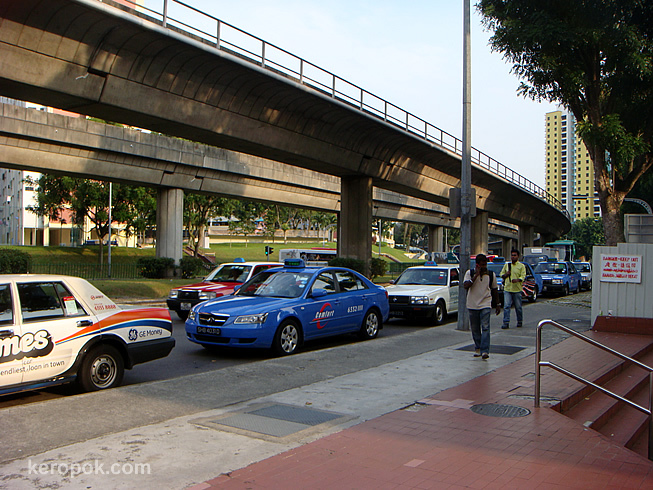 'Boring' Singapore City Photo: Long Taxi Queue, but no one's boarding the cabs. Oh well, becoming like Hong Kong now, thousands of taxis waiting for customer. Much better this way since we can hail a cab easily. Serve them right for those cab companies. It is simply too expensive to take cab these days. Let's hope it stays this way all the way. These transport companies deserve a black eye. If you feel expensive, don't take the taxi. Let them solve the "problem" in this way. Out of curiosity, is this photo taken in Clementi town centre? yes, we can really get a cab really easy nowadays! nowdays when you board, they try to convince you that it is not that bad! haha..
today's sunday times (6 Jan) has an article about it! this picture that i took, everytime i pass by, there's still a queue! the cab queue haha..
i have been taking buses or trains more nowadays, only when i am horribly late. or when there are 3 -4 person, it's still cheaper to take a cab. you sure you want to go round in a bike? singapore roads are not really bike friendly you know! my colleague who rides around can vouch for that! you are so sharp! yes it is!